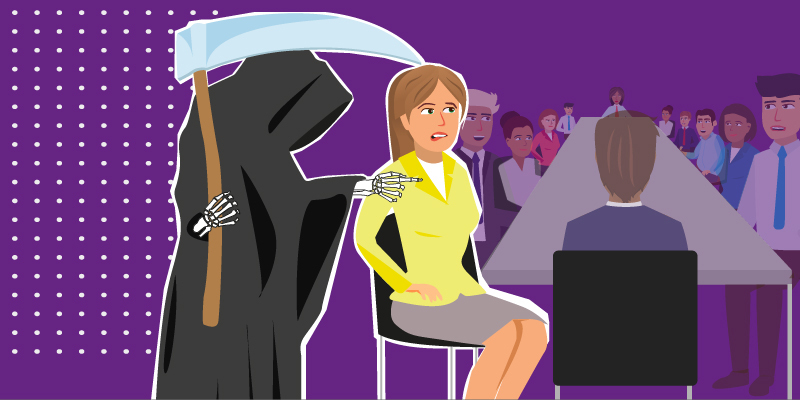 How to ‘Introduce Yourself’ in Big Scary Meetings AKA Creeping Death! Have you ever had a Creeping Death experience? I recently ran a LIVE webinar ‘How to Hack your Inner Confidence’ where one of my attendees wrote in during the live chat and described the moment she gets asked to introduce herself around the table in the meeting as “creeping death”. It’s like the grim reaper is coming to get you! Thank you ‘Liza’ for sharing your Creeping Death feelings with us. She says that’s what she and her colleagues call that dreaded moment. And she’s not alone. Hundreds of my clients have asked me how to combat nerves at that exact pressure point. How do you feel when you hear the words ‘please introduce yourself around the table’? It could be in front of new clients or the senior Exec Committee – arhhhhh, you have to come up with a 1 minute ‘blurb’ about your job title, you have to seem confident, relevant, senior enough to be taken seriously, clear, concise, credible, charismatic & clever ……yet…..how do you ACTUALLY feel? “Arrrrrrrhhhhhh I wish the ground would open up, I hate this, I am not listening to anyone else, I am totally obsessed with the fact I am coming out in a rash and I don’t know what to say…oh no, it’s getting closer to my turn, oh no, I have nothing to say….what’s my job title again? I can’t remember what my job actually is….oh Sh*t ****, ****, it’s only one person away, oh hell, I’m red, now I’m shaking, help help HELP…..”. Sound familiar? I’ve been there too, yes I wasn’t born 100% confident, I’ve had to work on strategies to gain confidence. And don’t worry, I’m going to share some easy shortcuts with you to handle these moments. First, though, this is a true story…and it will make you laugh…..
One of my clients is very senior in a global bank. She’s well respected and people ‘think’ she is completely confident and sure of herself because she is an outspoken, bubbly person who appears totally at ease at speaking in public, particularly around a boardroom table. However, she’s secretly NOT at all confident and HATES that feeling of ‘all the eyes are on me’. She confessed to me that the last time they had a global ‘summit’ with senior people from all over the world, she did something she is totally ashamed of because she panicked. There were about 40 very senior and influential people (including her, she is an influential person) sitting around the massive boardroom table on the top floor of the bank’s HQ in London. “Helen” arrived early to the meeting feeling ready to listen to the chairperson, but what she wasn’t prepared for was the dreaded sentence…. “First, let’s introduce ourselves around the table” …..aaarhhhhh at that moment, her heart jumped out of her mouth, she practically snorted her coffee and started to panic, pant, go red, sweat and she literally had that moment of ‘fight, flight or freeze”. Her natural instinct at that moment was ‘flight’. She looked at where she was sitting and in her blind panic calculated that she was around number 32 out of 40 and it would take approx. 30 seconds for each person to introduce themselves – therefore she had approx 16 minutes to do something drastic. She stood up, excused herself (as if she was going to the ladies) and as quick as a flash, vanished into the ‘client’ corridor where all the catering staff was busying themselves with the morning refreshments. It was 11 am. Helen couldn’t think of anything dignified to say at this point and carried on with her quest. With that, the catering manager went to the fridge and brought out the Chablis. Luckily it had a screw top, so it was easy to open. Helen pointed at one of the wine glasses on the trolley, and the catering manager got the message and passed it to her as he watched in horror as she opened the bottle right there in front of him. She poured herself a LARGE (over 250ml) glass, more like a fishbowl-sized glass of white Chablis and proceeded to gulp it down in one go. She ran back into the large boardroom for her ‘creeping death’ experience and she’d only been around 8 minutes so she had around 8 minutes left to compose herself with her now slightly rosy cheeks and possibly the odd hiccup! She didn’t hear one word of what anyone else had to say or who they were and concentrated on her job description and ‘survival’ techniques. When I asked her how it went she told me she couldn’t remember a thing. She must have wiped it from her memory, she went on autopilot, she had an out of body experience. It felt like it wasn’t even her in the room – someone had taken over her body. 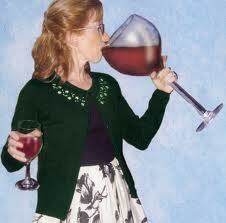 Apparently, she totally forgot to go and pay for her bottle of Chablis – oops! So I’d like to apologise to the catering manager for any trouble he might have got into because of the strange incident. At this point, I’d like to make it very clear that my top tip is DO NOT drink alcohol! Tee hee, it will NOT help you. ‘Dutch Courage’ is absolutely NOT a good idea, believe me I’ve tried. Alcohol may make your mouth dry, it may stop you from thinking clearly, and at worst it will make you slur your speech. A lazy drunken tongue is NOT a credible style! Yes I have tried EVERY single tip when it comes to public speaking confidence and nerves. Here’s what I shared with Helen…..if she ever gets herself in that ‘creeping death’ scenario again, here’s what she’s going to do….and You too! DO have a pre-thought through ‘elevator pitch’ – spiel! This is something you can work on any time when you’re totally relaxed. Remember the rest of the people in the room DON’T CARE that much about what you say and the chances are, they AREN’T Listening!! In fact, they’re all having their very own creeping death anxiety moment too! Avoid, sticking to the SAFE name, job title answer. It’s fine but it’s totally unmemorable. Remember your audience only care about them, so say something about the audience. Say something with a feeling…example… about what you’re “looking forward to” or something that will make them curious and hook them in! Hi, great to meet YOU! I’m Alice and I’m looking forward to sharing my project details with you – it’s been a real roller coaster ride this year. I’d be really happy to chat with you after this….or give them a tiny piece of the story there and then. Ie/Looking forward to, loving the project, finding it a challenge, surprised by XYZ, excited about XYZ. There you have it, creeping death doesn’t have to mean you’re going to be picked off by the grim reaper, it’s your chance to shine. If you say one thing that makes the audience think “Oh?”. There’s no such thing as a boring person! No, it’s true. Maybe you haven't found an interesting way to express yourself yet. I don’t do boring. When I help lawyers and bankers pitch and present – that’s a BIG RULE. And it does mean you have to venture outside your comfort zone (just a bit)…but the rewards can be massive.